Affordable Designer Area Rugs for Those You Love! Welcome to Hollywood Love Rugs, featuring affordable elegant area rugs, designer area rugs and accessories for your home; including exotic cowhide, faux fur, natural fiber, shag and sheepskin area rugs; and matching throw pillows. Whether you are shopping for conventional area rugs or something exotic and unusual, we bring forty years experience providing affordable solutions to the entertainment industry and design trade, to help our customers acquire those special area rugs on a budget they can afford. Our collections bring something special to every room, and we feature specialty items for the living room, bedroom, dining room, bathroom and child's room. 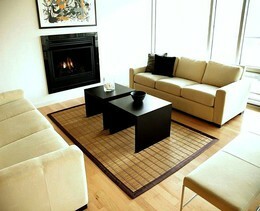 We make custom area rugs in large selection of natural materials and specialize in personalized service. Do not hesitate to contact us about your home decorating needs. Selling online since 1999. If you are looking for beautiful and soft area rugs and simulations of a natural bear or luxurious fur area rugs, but without the use of animal products, then our faux fur area rugs are just the thing for you. Faux fur area rugs are exotic rugs with the real look and feel of fur, but made from synthetic materials, hypoallergenic and with a non-skid backing. Imagine a bear without fur, that is what our faux fur and fake bear area rugs provide; as well as a full line of faux animal rugs in exotic African animal print patterns, and faux sheepskin area rugs. 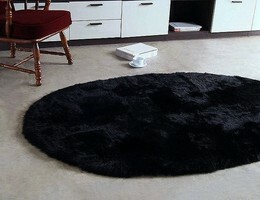 Our faux fur and fake bear area rugs are 1200 grams per square meter. All of our faux fur area rugs are made in Europe under strict EEU environmental standards. Hollywood Love Rugs is a leader in the importation and sale of these wonderful and affordable decor items, and has sold their exclusive brand on the internet since 1999. These fake fur area rugs are beautiful, exotic and luxurious; suitable for any room in the home and especially popular for that adventurous child's room. Hollywood Love Rugs has been selling the best Brazilian select chromium tanned cowhide area rugs and cowhide pillows for forty years. We are experts, and can hand select cowhide rugs to your specifications, as well has having a large selection of stock items. Brazilian cowhide is by far the most superior cowhide leather in the world and is suitable as highly fashionable area rugs, wall hangings, throws and upholstery material. Our select chromium tanned Brazilian cowhide area rugs are selected from various premium cowhide sources to guarantee quality, beauty and lush softness of pile. 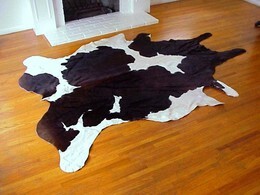 Natural cowhide has become a very popular home decor item, and is associated with classic Western and Southwestern decor. 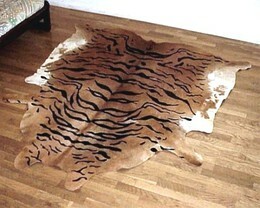 But we have exotic African animal print cowhide rugs as well as solid color dyed cowhides, acid wash and other exotic renditions of the cowhide rug. These are easy care and stand up to heavy traffic. 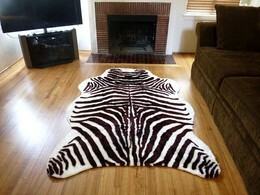 Animal Print cowhide rugs are available in many variations of tiger, leopard, zebra, giraffe and Cheetah prints. These are stenciled and dyed with permanent colors. We also have solid color cowhides, natural and dyed. Extremely durable, these select cowhides can last a lifetime. Custom cowhide rugs are available in virtually any shape, size, natural pattern animal print or patchwork style pattern, as well as matching cowhide pillows. In addition to our exclusive collections of faux fur rugs, we also carry the most exotic and luxurious fur area rugs in a large range of styles, colors and textures. 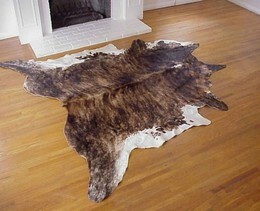 We feature Bowron, New Zealand, sheepskin pelt rugs. These are available in natural styles of single, double, quad, sexto and octo pelts, as well as handmade area rugs and designer sheepskin rugs. Bowron is the premiere tanner of sheepskin and lambskin rugs in the world, using a unique patented Eco-friendly process designed to produce quality fur rugs in an environmentally sensitive manner. No toxic or harmful chemical are used in the processing of the skins, and no genetically engineered material is used. 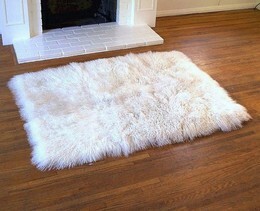 Sheepskin area rugs are naturally beautiful, luxurious and comfortable. Thick, soft and luxurious. 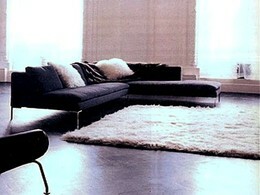 Nothing compares to the luxuriousness and durability of sheepskin rugs or its natural comfort for the human body. We also exclusively feature hand sewn Tibetan Lambswool rugs and pillows. Tibetan Lambswool has a luxurious and silky pile length of about five inches and is the ultimate in luxury and fashion. Animal print area rugs are one of the most popular rug styles in contemporary home decorating, valued for their natural colors and patterns. These prints and colors bring an exotic and exciting feeling to home decor. 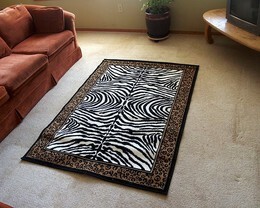 Animal print area rugs are now available in a large range of colors,patterns and materials for every budget and taste. 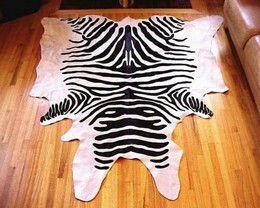 Choose from cowhide animal print rugs in many color varieties of zebra, leopard, tiger, cheetah and giraffe; or contemporary woven animal print rugs which are inexpensive, durable and easy care exotic equivalents, and even faux animal hide and skin rugs with beautiful natural animal print patterns and colors. Choose from Zebra, Tiger, Giraffe, Cheetah, Jaguar, Leopard, natural and faux cow print rugs in a selection of patterns and colors. Natural fiber area rugs, such as Bamboo, Sisal, Sea Grass and Jute, bring traditional beauty, durability and sustainability to your home decor. They possess unique qualities of classic and traditional beauty, extraordinary durability, and are all Eco-friendly; having unique natural qualities that make each one perfect for different applications. Environmentally friendly products are gaining in popularity because they are sustainable and Eco-friendly as well as naturally beautiful and versatile. Bamboo is remarkable in its beauty and durability. Its fibers are far stronger than wood fibers and much less likely to warp from changing atmospheric conditions. Known for its beautiful luster, Jute fibers are characteristically long, soft and shiny and strong. Its fibers exhibit naturally anti-static, insulating and moisture regulating properties. Sea Grass is an abundant marine grass with thick, flat and smooth fibers. Its fiber is extraordinary durable and is a perfect fit for high traffic areas. Sisal is the most popular of the plant fibers. Sisal has long, fine, stiff fibers that allow it to be made into smooth textured yarn. Sisal fibers are anti-static, sound absorbing, flame retardant, durable, and stretchable, non dust attracting. Shag area rugs made their mark as a cultural staple in America during the disco era of the 1970s and brought about a cultural and design revolution. They offer the additional comfort of being thick, soft and luxurious and are available in a wide range of styles, colors and patterns. 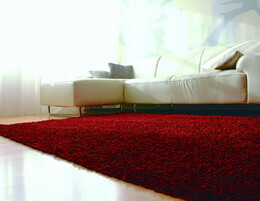 Flokati wool shag rugs are still made in the traditional way, as they have been in Greece for 1,500 years. 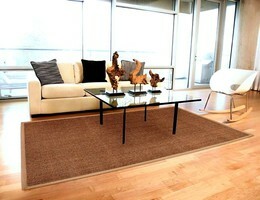 Flokati area rugs are naturally stain and soil resistant. Traditional Flokati rugs are made from 100% New Zealand Drysdale Wool Type 126/7, by far the best in the world. Their soft subdued appearance and feel goes with a host of subtle settings. Suede leather shag rugs are handmade and imported from India, these leather shag rugs are unique and are extremely heavy with a thick non-skid backing. Natural contemporary Bamboo-Cotton shag rugs are softer and silkier than traditional shag rugs made from wool or synthetic fibers; naturally antimicrobial, hypoallergenic and antibacterial which promotes a healthy environment in your home and resists odors. We offer diverse collections of polypropylene themed area rugs for the contemporary home as well as lodge, cabin and vacation home, and for every room in the house. 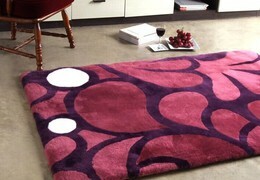 These themed area rugs are economical, easy care, durable, stain and soil resistant. They come in brilliant permanent colors and a wide range of styles and patterns, including animal prints and novelty themes; including African, musical, wildlife, subculture, magical, mystical, animal print, and lodge rugs. These economical area rugs offer great beauty, style and utility for an extremely affordable price and provide unusual durability in high traffic areas. Hand sewn from natures materials, these exotic and stylish decorative throw pillows bring added comfort, luxury and excitement to your home decor. Flokati wool shag pillows are suitable as accent pillows, couch pillows or decorative pillows in the bedroom. 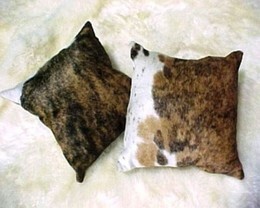 Natural and animal print cowhide throw pillows are a perfect complement to your cowhide rug. 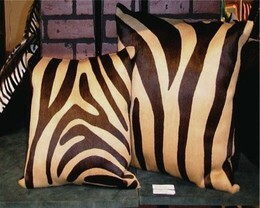 We can custom order these accent and couch pillows in the same materials as many of our exotic area rugs. If you do not find the rugs you are looking for on our website, rest assured we have access to any rug you may be considering for your home. We specialize in personalized service. Many of our products are available as custom orders; including cowhide leather, sheepskin, Tibetan lambswool, Flokati and decorative pillows.